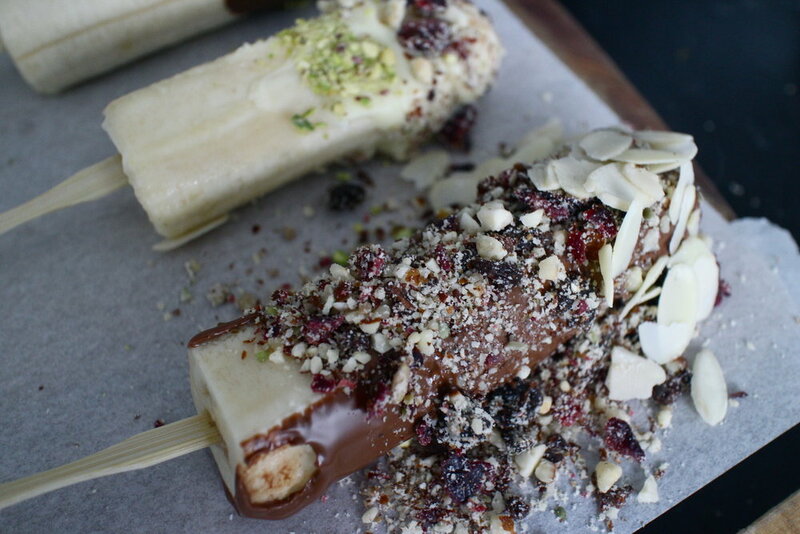 If you want to keep these dairy free and low in sugar make the banana pops with our vegan chocolate dip recipe. If you prefer to keep it simple and low prep buy some dark chocolate and melt to use as the chocolate coating. We used 70% cocoa dark chocolate and also white chocolate as we ran out of cacao powder. The topping over the chocolate is made from nuts, seeds and dried fruit. It looks beautiful and adds a yummy crunch which is a great contrast to the gooey banana. Nut topping:choose any of the following and have 1 cup worth. 1. Cut bananas in half and skewer with a wooden stick. Place bananas onto non stick paper on a baking tray and put into the freezer. 2. Place dried fruit, nuts and seeds into a blender or food processor and gently pulse until they are into smaller pieces. Place into a bowl. 3. If you are making the vegan chocolate dip gently melt coconut oil in a pan over a low heat on stove top, take off heat and stir in cacao powder and the sweetener. Put the chocolate dip onto a plate so it makes it easy to roll the bananas in. 4. Take bananas out of the freezer - roll each banana in the chocolate dip and place back on baking tray. Sprinkle with the nut topping. Repeat with each banana and then place back into the freezer until chocolate has hardened. These can be stored in the freezer or fridge. I kept mine in the freezer for a few hours and then moved into the fridge as I didn't want the bananas to be rock hard.